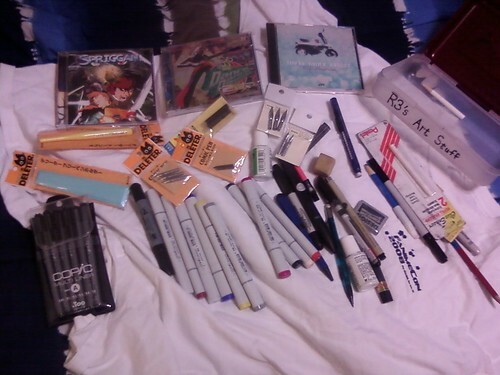 Rescued From The Abyss (1 in a semi-continuing series): Art Supplies and CDs! Comments Off on Rescued From The Abyss (1 in a semi-continuing series): Art Supplies and CDs! These were stashed in a few boxes up on a shelf in a closet in the house, and some were in a box by my bed. I’ve got here, resting on a Size XL FanimeCon 2008 T-shirt (I’ll fit into it by the end of this year, or beginning it next!)…. JVC’s domestic release of the You’re Under Arrest (Taiho Shichau Zo!) OAV soundtrack. I also found a mostly blank sketchbook, but I’m looking for the one that’s got my writings and the semi-decent sketches in it. I’ve freed up three cardboard storage boxes! I also know where most of my "How To Draw Manga" books are, as well as my Hogarth’s "Dynamic Wrinkles and Drapery" book. Still need to find Hogarth’s "Dynamic Anatomy" and Jack Hamm’s "Drawing The Head and Figure" reference books. More buried treasure excavations Wednesday night and most of Thursday.